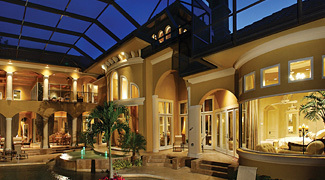 Total Living: 8,088 sq. ft. This rambling home spares no attention to detail. 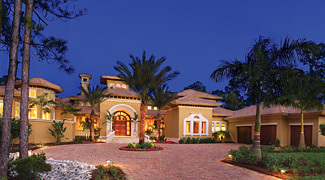 Turrets, arches, and multiple rooflines evoke an updated Mediterranean feel. The rear exterior is just as dramatic as the front, featuring curved walls of glass in the breakfast area, grand solana, and master sitting area. Another view of the rear reveals the pool and outdoor living spaces on both levels.